Loyalist Students come up big winners at the National Pictures of the Year Gala. The News Photographers Association of Canada (NPAC) held their annual conference in Calgary this past weekend (April 26-27) culminating on Saturday night with the National Pictures of the year Gala. Loyalist has been lucky enough to witness a string of students win the Student Photojournalist of the year and this year was no different as Justin Tang won the award for his portfolio submission. Justin has just completed an internship with the Canadian Press and is off to work at the Montreal Gazette for the summer. 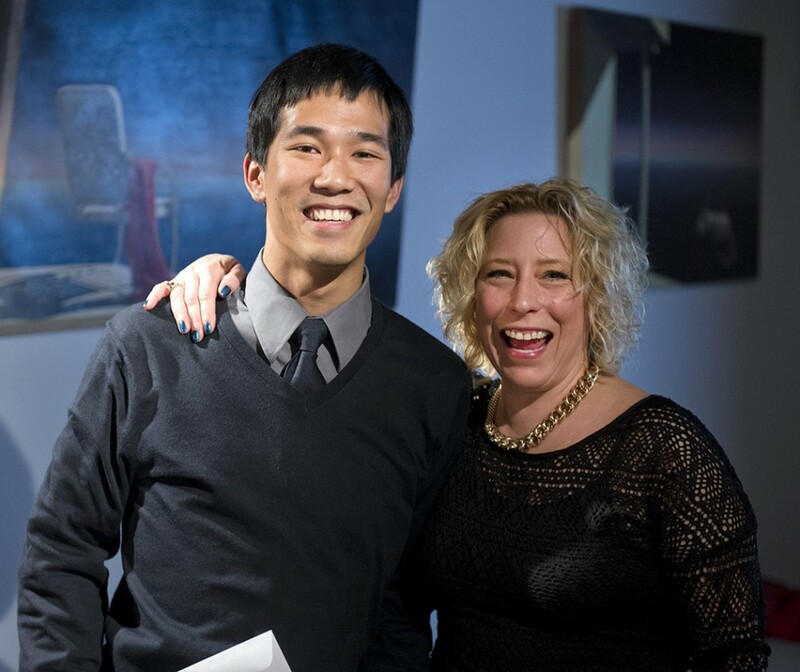 Ali Ledgerwood (Sales/Marketing Coordinator, Administrator for the News Photographers Association of Canada) presents Justin Tang with the Student Photojournalist of the Year Award sponsored by SAIT. Justin is a second year student in Loyalist College’s Photojournalism program (will be graduating in 2013) and a former graduate of Queen’s University, where he completed his B.A. (Hons.) in Human Geography and Psychology. While attending Queen’s, Justin served as the Photography Editor of the school’s student newspaper, the Queen’s Journal, and recently spent a summer as a photography intern for the Toronto Community News. A native British Columbia Justin has developed an appreciation for the urban environment as well as the outdoors; his deep curiosity about the relationship between the two continues to influence his work. This year held an extra special surprise for our students, as Marta Iwanek and Patrick Callbeck were both nominated in the Single Multimedia category. The opportunity for the students and myself to be present at the Gala was made available by the college and we were grateful for the experience. After the Honorable mention and 3rd place prizes were announced to very experienced and highly regarded photographers from the Globe and Mail and the Toronto Star it was immediately apparent that our students had captured first and second in the category. I looked behind me to see their reaction and Marta and Patrick were already congratulating each other, what a moment. Melissa Tait, (PJ Grad 2010) later informed me that I looked like a kid on Christmas morning. It is a rare thing for a college instructor or any teacher really to have the opportunity to see our students have such a high level of success so early. For those of you who know me you will understand when I say Christmas morning does not even come close! 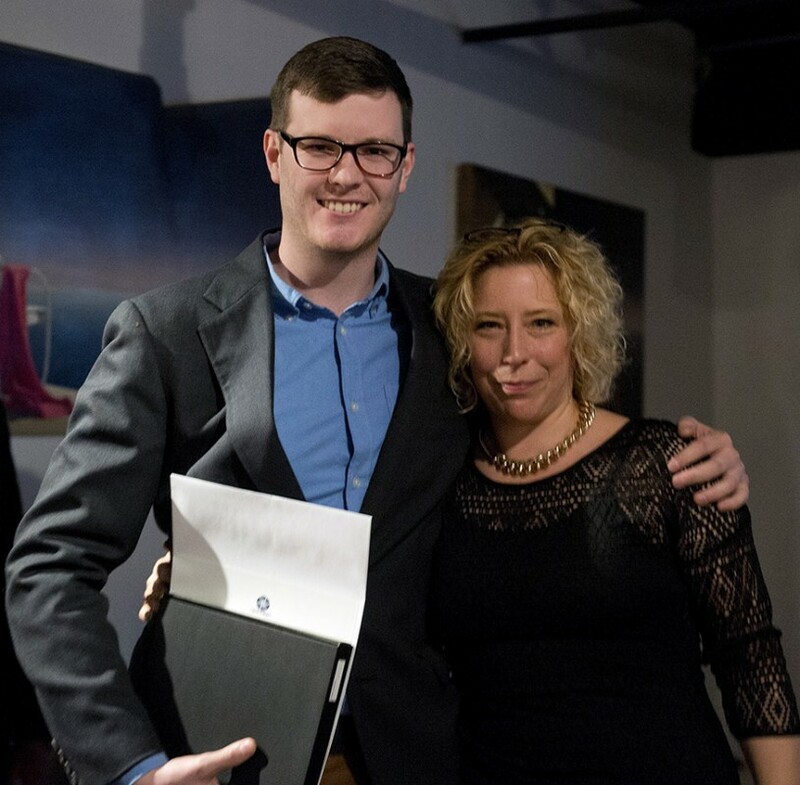 Ali Ledgerwood (Sales/Marketing Coordinator, Administrator for the News Photographers Association of Canada) presents Patrick Callbeck with the award for first place in the single Multimedia Category sponsored by the Globe and Mail. Callbeck won for his story, “They Don’t Rest” about Belleville local, Patrick Mcdonald of the Ontario Paranormal Society. Patrick is a is a second year student in Loyalist College’s Photojournalism program (will be graduating in 2013) and a graduate of the University of Prince Edward Island where he completed a Bachelor of Business Administration BBA. Recently Patrick completed an internship with the National Film board in Halifax where he will be pursuing a career in documentary work. 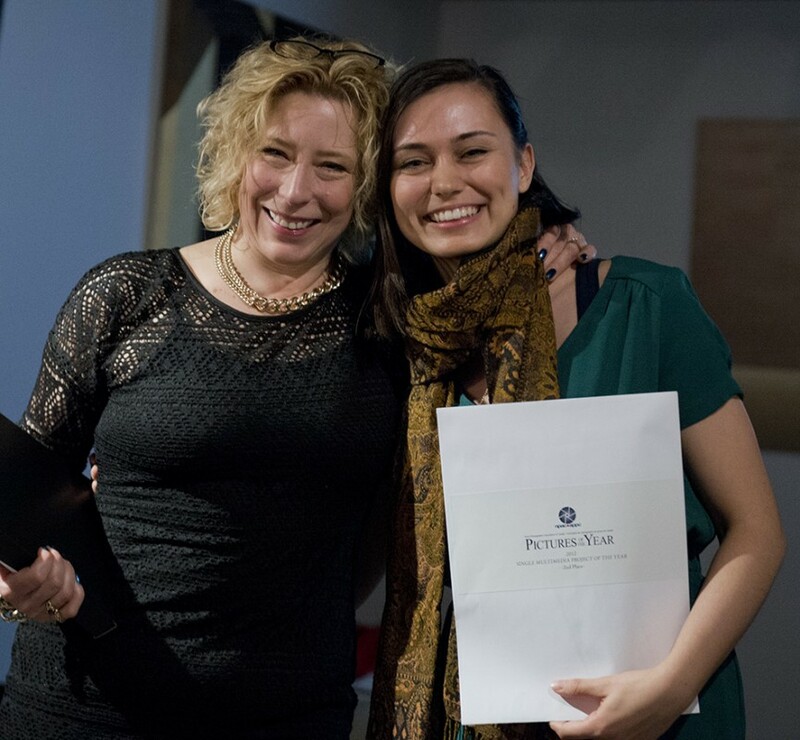 Ali Ledgerwood (Sales/Marketing Coordinator, Administrator for the News Photographers Association of Canada) presents Marta Iwanek with the Second Place award for the single Multimedia Category sponsored by the Globe and Mail. Iwanek captured second place with “A Different Kind of Love,” about Shirley Sheady (77) and Ross Burrows (91) a young at heart couple from the county who found each other later in life and wed in 2012. Marta is a second year student in Loyalist College’s Photojournalism program (will be graduating in 2013) and a graduate of the Ryerson University School of Journalism. Marta will be working this summer as a photographer at the Waterloo/Kitchener Record having worked the previous summer with Metroland Media Group Halton. An accomplished storyteller at a young age, Marta won the Shaun Best Memorial Scholarship in November 2012 for outstanding potential and promise in the photojournalism program. This entry was posted in About, Multimedia and tagged awards, Calgary, Canada, College, journalism, Loyalist, NPAC, photography, Photojournalism, program, school, student, Student photojournalist of the year. Bookmark the permalink.